The journalist who described herself as a “layout person” walked away with the country’s top investigative journalism prize in Johannesburg last week. 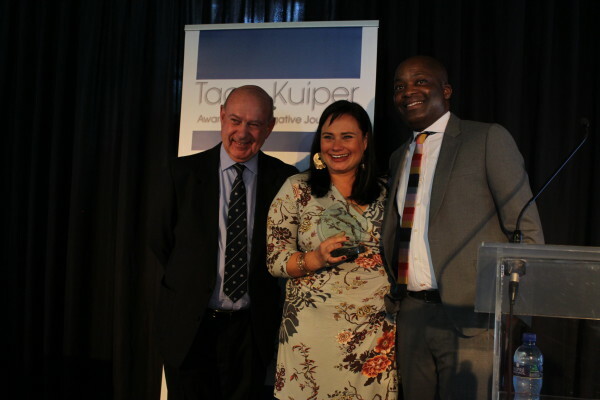 Suzanne Venter, a journalist at Afrikaans newspaper, Rapport, has won the Taco Kuiper Award for Investigative Journalism for her expose of the deaths of close to 100 mentally-ill patients in care centres, now known as the Life Esidimeni story. “I am actually known as the celeb journalist … This is special to me because I started out as a layout person and people actually saw me as someone who could do make-up and write celeb stories. But I always wanted to do more,” said Venter. According to Venter the story, which has resulted in an investigation by the Health Ombudsman, started with a Facebook message sent to the Rapport page by a parent who was looking for help after their child was moved out of the Cullinan Care Centre to a government NGO. Despite facing significant hurdles trying to get answers from Health MEC Qedani Mahlangu, Venter persisted in uncovering the truth. Acting convenor of judges, Justice Malala, said “When Suzanne Venter first confronted former Gauteng Health MEC Qedani Mahlangu with this story she was told that “all this is just hearsay”, and she was kicked out of the MEC’s office. Venter stayed with the story for months, brought us the human side of it while exposing the corruption and insensitivity of our political leaders as they refused to accept what was happening.” Venter said that her news editor supported her by saying that all journalistic work is investigative and that everything you do one must do thoroughly. “So the story itself grew spontaneously. I just didn’t want to leave it, especially after people had died,” said Venter. Last year’s winner Pieter-Louis Myburgh said, “I am immensely happy on Suzzane’s behalf. We are former colleagues at the Rapport newspaper and I kind of saw this story grow under her pen, into something that obviously become a massive national issue. I think that it is well deserved”. “I think it is something we can rally around because it is a vitally important function in a democracy like South Africa,” said Myburgh. Venter was rewarded with a cheque for R200 000 for her work while the State Capture story as covered by Thanduxolo Jika, Sabelo Skiti and Qaanitah Hunter for The Sunday Times took the runner-up prize of R100 000. American journalist Ben Bradlee Jnr delivered the keynote address reflecting on his investigations into the sexual abuse of young boys by Catholic priests for the Boston Globe in 2001/2. His work was the inspiration for for the Oscar-winning film, Spotlight.